This move is the biggest fleet modernisation ever to make the world’s best premium cruise line more incredible than before. 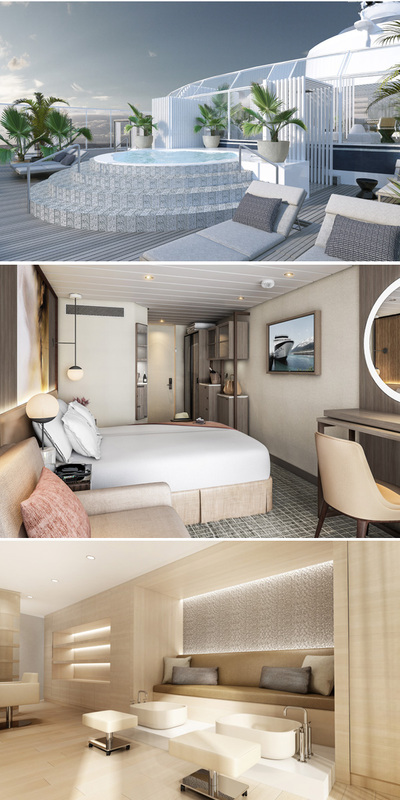 This involves redesigning the accommodations on board all the ships; introducing exclusive new sanctuaries for all Suite Class guests called The Retreat Sundeck and The Retreat Lounge and making luxurious upgrades to the restaurants, bars, and lounges. Alongside, new shopping experiences featuring sought-after brands and designers, such as Hublot will also be added, overall offering guests a leading-edge vacation experience. The Revolution began with the introduction of the new ship, Celebrity Edge, with an innovative outward-facing design that connects guests to the sea and the destinations beyond like never before. It continued with the announcement of Celebrity Flora, the first ship designed specifically with the Galapagos Islands in mind. As well as Celebrity Apex, which will be taking the brand to the next level, offering guests the best way to experience the world in modern luxury. The transformation of the brand’s award-winning ships is spearheaded by visionary designer, Kelly Hoppen, MBE. She has designed for a number of celebrities, including David Beckham, Victoria Beckham and Martin Shaw. Hoppen has authored eight design books to date, and is a TV personality, making regular appearances on design-focused shows. She is one of the judges on The Great Interior Design Challenge on BBC. Hoppen will infuse the newly added Reflection Suite and Signature Suites, with her signature style – a subtle, coordinated fusion of East meets West, with clean lines, neutral tones, and a warm, inviting opulence. “This was a new and exciting challenge to recreate something stylish and luxurious yet totally different from the accommodations that I have designed for Celebrity Edge,” said Hoppen. “I wanted to invoke a feeling of timeless luxury that welcomed guests into their own haven. Your bedroom is where you sleep and where you wake, two of the most important times of day, especially when you are on vacation. It was important to create space, harmony and luxury within a 'home away from home' setting and I think we achieved this balance perfectly,” she added. Celebrity Cruises is always looking for new ways to open the world, not only through the places the brand visits, but through globally inspired culinary experiences, as well. Guest-favourite restaurant Qsine will be added across the fleet and completely renovated, now offering the brand’s virtual Le Petit Chef experience, created by the world-famous artists of Skullmapping and presented by TableMation exclusively for Celebrity. The Oceanview Café will be redesigned with an open, airy, marketplace-inspired design, offering guests island after island of international delicacies, while the already-stunning Main Restaurants will undergo a beautiful redesign, with new textures and new finishes added throughout.